This Indian vision of development has a living relevance for the future evolution of human society. For, as Sri Aurobindo points out, “…in the next great stage of human progress it is not a material but a spiritual, moral and psychical advance that has to be made…”2 The entire humanity in general, and the affluent nations of the West in particular are now poised or even compelled to make such an evolutionary leap. It is now recognised by most of the economic and development experts that there are certain ecological limits to economic and material growth, Artha, and most of the affluent societies in the West are on the threshold of these limits. What the ancient Indian seers perceived from the point of view of moral and psychological considerations, modern economic and development thinkers are arriving through the ecological route. But what is not equally recognised by these modern experts is that just as there is a limit imposed on the economic and material growth in the dimension of Artha by the ecology of the physical and biological dimensions of Nature, the Dharma of our material Mother, there is also a limit to the satisfaction of Kama, the desire for vital enjoyment, by the ecology of the subjective dimensions of Nature. Unchecked and indiscriminate indulgence of vital passions, kama, whether by the individual, the collec­tivity or a civilisation leads to the exhaustion of the vital energy of the human being and as a result loss of the creative force needed for higher evolution and progress. The present critical situation in the ecological and energy front has created a wide­spread awareness and interest among the economic community in energy preservation and management. But in a predominantly materialistic civilisation like ours, the focus is primarily on the material energies. The preservation and management of human creative energies which is more important or at least as important as material energies is not receiving as much attention. So what is needed for the secure evolution of humanity and earth is to create an ecologically and psychologically sustainable society in which the spiritual, psychological and material resources and energies of humanity are intelligently preserved and harnessed for the safe and smooth progress of humanity towards its evolutionary destiny. In this task, Indian insights on development, which we have discussed so far, provides a good conceptual framework for contemplation and action. Sri Aurobindo, SABCL, Vol.1, Bande Mataram, Pg.465. is actually good and the visitors are genuinely sharing nice thoughts. I wish to show thanks to the writer for bailing me out of this particular crisis. Right after searching through the search engines and obtaining ideas which were not productive, I figured my entire life was done. Being alive without the presence of strategies to the problems you’ve solved by way of the article is a crucial case, and ones that would have in a wrong way affected my entire career if I had not come across your blog post. Your good expertise and kindness in dealing with a lot of things was important. I’m not sure what I would’ve done if I hadn’t come upon such a subject like this. It’s possible to at this moment look forward to my future. Thank you so much for your skilled and sensible guide. I will not think twice to suggest the blog to any person who desires care on this problem. 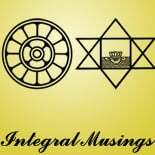 This entry was posted on November 16, 2016 by integralmusings in Society & Culture.